8. Use efficient lighting and appliances. A HERS model can get a real boost from Energy Star rated appliances. All fixtures should be either CFL or LED lighting. Insulated sheathing with seams taped is a good primary air barrier. This practice will be required just north of Massachusetts in zone 6 climate regions. Adding 1- 2” of continuous rigid board to the exterior of 2x6 walls with cavity insulation, reduces whole building leakage rates and improves overall UA values of wall assemblies. 6. Properly size high efficiency mechanical equipment. This may sound like a no-brainer but many installers don’t properly size heating and cooling systems. All combustion equipment should be sealed combustion. 5. Work with a HERS rater in the design process. A HERS rater isn’t there to simply inspect and pass or fail. 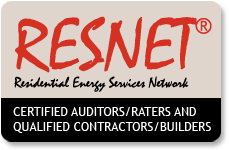 This consultant should be willing to support code compliance and to maximize utility rebates. 4. Insulate basement slab and walls . By insulating basement walls instead of the ceiling, duct work or hydronic distribution lines in the basement do not need to be tested. An insulated basement is a much more functional space. Insulating the basement walls and adding supply heat to the basement can have a positive impact on a HERS index. 3. Understand ventilation options. The 2012 code mandates compliance with ASHRAE ventilation standards. There are several ways to achieve this - from expensive balanced systems (ERV, HRV) to simple inexpensive bath fan timer switches. Know your options and design accordingly. Proper ventilation improves indoor air quality and maintains building durability. 2. Avoid forced air ducted systems. Save thousands on a smaller point-source heating system and invest the savings in insulation. Your clients will be happier in the long run. If a large system is needed, select a hydronic system over hot air and avoid air conditioning or use ductless mini splits in targeted areas. The 2012 IECC requires blower door testing for all new homes. 1. ….. Draw the air-barrier. Literally draw the primary air barrier on building plans and call out areas that may need special attention to detail (rim bands, penetrations through attic, cantilevered floors, etc. ) The 2012 IECC mandates 3 ACH50 (air changes per hour). Address whole house air leakage before building starts. Happy New Year and energy efficient building.